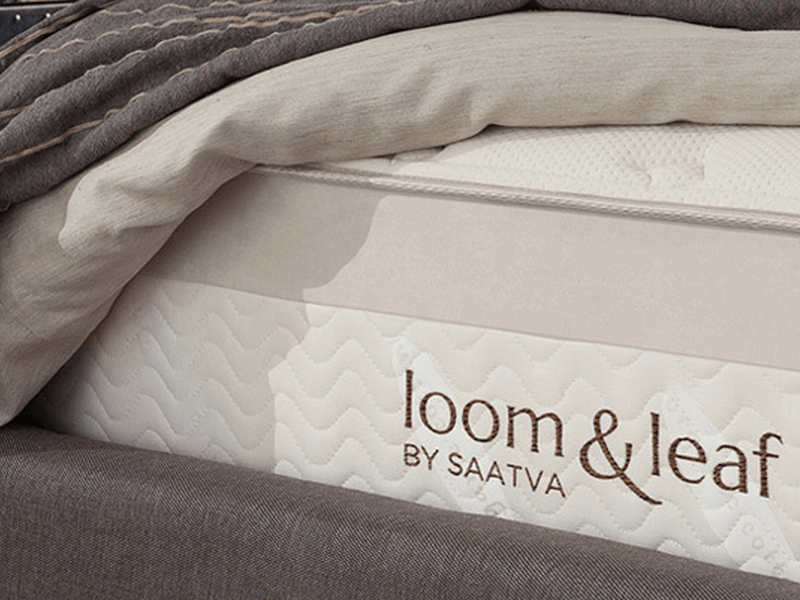 Even as a relatively recently launched sub-brand of US online mattress company pioneer Saatva—which was founded in 2011—Loom & Leaf is without a doubt one of the first to sell hybrid foam mattresses of a proprietary design through e-commerce. 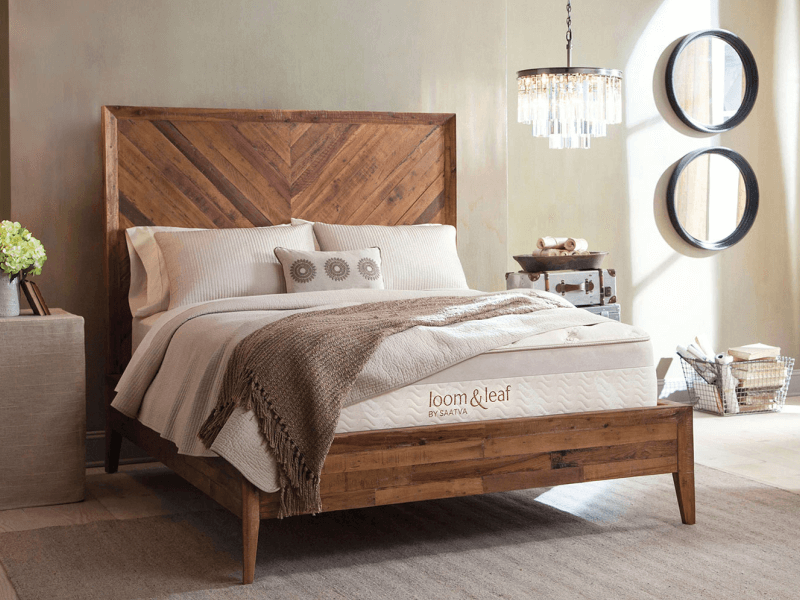 In 2015 Loom & Leaf hit the ground running with its luxury memory foam mattress, providing a slew of features that surpass industry averages to this day: a 120-night trial, a return policy with a full product price refund, and a 15-year product warranty. When Loom & Leaf says luxury, they aren’t kidding around. The construction of this product is very different from many of its competitors. First of all, the mattress has a thickness of a whopping 12 inches; composed of a stack of four layers of different types of CertiPUR-US approved foam, the upper two of which are memory foam variants. Then, there is also what the company calls a “cooling gel spinal panel” laminated onto part of the top layer of foam—the area where a sleeper’s lumbar region would usually rest. Finally, the foam is encased in a non-removable quilted mattress cover. The two-inch top layer is made of gel-infused memory foam that provides comfort and cooling. Not only does Loom & Leaf’s proprietary “gel-swirl” technique make sure that the durable and non-toxic gel is infused all throughout the foam evenly, but—much like the Leesa mattress’ top layer—the layer is cut into an inverted foam tip pattern, creating airflow channels for better cooling and circulation. As mentioned earlier, there is a laminated panel of the cooling gel across the middle of the top layer, providing extra cooling to sleepers’ lumbar region, where the body generally retains the most heat. More than any other layer, this is Loom & Leaf’s nod to innovation, and what makes it unique. Next is the core memory foam layer, two and a half inches thick; this gives the mattress contour and deep compression support, as well as pressure relief. 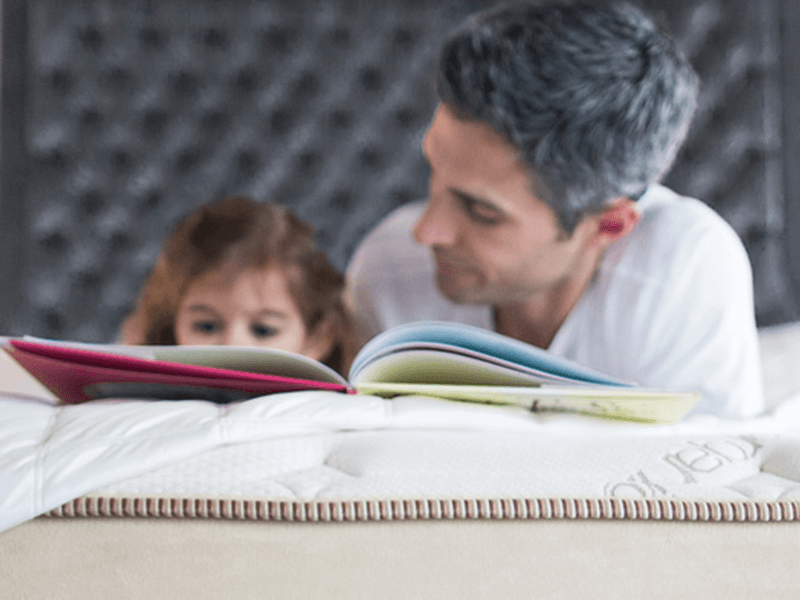 The penultimate layer is a two inches of transition foam, or a “loft pad”, as Loom & Leaf calls it; resting between the memory foam layers and the bottom layer, which allows for not only a gradual change from memory foam to support foam, but also helps even out weight distribution, sleeper support and overall comfort. Finally, there is the foundational bottom layer: a high-density support foam, five and a half inches thick, that acts as a base to increase durability and support the foam layers above it. Instead of the typical fire sock and mattress cover over it, the Loom & Leaf mattress has an all-in-one cover; with an organic cotton knit top, a foam layer of a little over half an inch, and a flame retardant barrier made of natural thistle all quilted together to form the cover material. The foam, thin as it is in comparison to the foam layers inside the mattress itself, does add to the unique feel of the product. While we’re not huge fans on non-removable covers, in this case the quality and design do make up for it. If you’re worried about not being able to spot clean properly, it may be ideal to just use a third party mattress cover that’s machine washable. As a luxury memory foam mattress, Loom & Leaf promises that hug and contour typical of the material—but with the cooling gel and the added foam on top, excessive sinkage and heat retention is managed well. One uncommon feature the mattress cover has is handles on the sides; to make it easier to move around, especially when it comes time to rotate the mattress yearly. While this add-on may be something that is not so unusual to see in a showroom, for an online mattress purchase it can be rare—especially if you’re talking about offerings of the all too popular mattress-in-a-box craze. What sets Loom & Leaf apart from the pack is the fact that they do not have a “one mattress fits all” approach. While they do have a “flagship comfort level” called Relaxed Firm—a design that the company initially came out with when they launched—simulating a “sweet spot” that would be comfortable for most people; Loom & Leaf also has a Firm option, which is not as soft, and is constructed exactly the same but with denser foams. The Loom & Leaf luxury memory foam mattress is available in six standard US mattress sizes: twin, twin XL, full, queen, king and California king. Every mattress is 12 inches thick, and because of this, quite heavier than most similar products offered by competitors. For comparison, the Loom & Leaf queen-sized mattress is about 93 pounds—one pound more than the Leesa California king-sized mattress and a full ten pounds heavier than an Endy California king-sized mattress. While the company typically recommends a package purchase of the mattress with either an adjustable bed base from sister sub-brand Lineal or a matching Loom & Leaf box foundation—they also suggest an optional bed frame to push the foundation off the floor—you can purchase just the mattress. If you have an existing box foundation that is less than seven years old and in great condition, it will suffice. Loom & Leaf mattresses also work great on platform beds with solid surfaces or slats spaces less than four inches apart. Worth noting that if you are buying a queen-sized mattress or larger, any structure you put it on needs to have at least one vertical center support underneath. The best part about buying a Loom & Leaf luxury memory foam mattress is the hassle-free setup and delivery. If you feel uncomfortable just clicking buttons and checking options on the website for such a huge purchase, you can even call a customer service representative and order the mattress by talking to a real person on the other end of the line. You will receive a call anyway if you place the order online; a representative with clarify order and delivery details before the shipment is processed. A Loom & Leaf mattress gets shipped uncompressed and ready to use, and delivery men will carry it inside your home and set it up for you. Unlike most online mattress-in-a-box startups, Loom & Leaf does not offer free shipping; but it’s important to note that their mattresses don’t come in a box and are not delivered with front-door service only. This includes any other product purchased with the mattress, by the way; so if you did also buy a foundation, bed frame or an adjustable bed base, just sit back, relax, and watch as it is all assembled in front of you. Because the mattress isn’t compressed in a box, it doesn’t need time to expand; and even though the Loom & Leaf mattress uses a lot of memory foam, the smell is faint and there’s no significant off gassing. Another extra feature the company offers is old mattress removal—for a small fee. You can pay them an extra $39 to haul away your old mattress after they deliver your new one. The Loom & Leaf mattress has a weight capacity of 300 pounds per side, for a total of 600 pounds. For sleepers on the heavy side, they suggest the Firm mattress rather than the flagship Relaxed Firm, simply because the denser material may offer more support overall and be less prone to too much sinkage. Having two firmness options seems to help Loom & Leaf mattress sleepers a lot. Reviews left on the product website and collected by Google Customer Reviews, Reseller Ratings, and Trustpilot show mostly positive reactions; particularly when it comes to customer service. A few negative reviews here and there mostly have to do with comfort incompatibility—but thankfully, a trial and return policy does help with that. Although Loom & Leaf is just in the early stages of establishing a reputation of its own,parent brand Saatva has paved the way considerably. Launched in 2011 as one of the first mattress companies with roots in e-commerce, Saatva’s ensuing success spawned not only the creation of eco-friendly and luxury brand Loom & Leaf, but also Zenhaven—a different sub-brand specializing in natural latex foam mattresses. Saatva is partnered with what they call “high-need organizations” across the country, too; donating mattresses and giving back to the less fortunate. A remarkable feature of the Loom & Leaf luxury memory foam mattresses is the 15-year warranty—it’s more than the standard mattress-in-a-box offering of 10 years, though still not as long as the 20-year warranty of GhostBed or the “Forever Warranty” of Nectar. Before a potential buyer concerns themselves with that, though, there is the very generous 120-night trial; which is over two weeks longer than the industry average of 100 nights. Returns are easy, though it’s worth noting that Loom & Leaf only refunds the cost of the mattress; the fee of the initial delivery is not included in the computation. If there are questions you have that are not answered by the FAQ on the product website, their customer support services should make it easy for you to find out whatever it is you need to know. In particular, the live chat option is quick, efficient and painless to use. As of this writing, the queen-sized Loom & Leaf luxury foam mattress—of either firmness option, and on its own—is available for $1,299 plus a delivery fee based on your location. A little on the expensive side, when compared to other online mattress company offerings; but a steal when compared to other luxury mattresses. 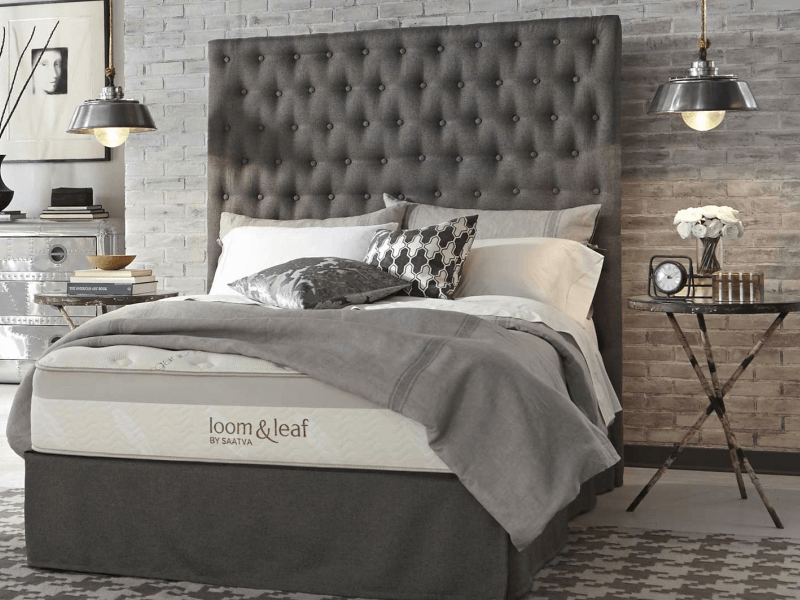 Loom & Leaf compares their product to Tempurpedic’s TEMPUR-Cloud® Luxe Breeze, the queen size of which currently retails for a little under $5,000. These prices include free white glove delivery. This means our team of trained experts deliver an uncompressed mattress, perform all setup, and take away the old mattress at no additional cost. Loom & Leaf mattresses also come with a 15 year warranty and 120 night trial. These are all excellent selling points. This mattress is truly luxurious; made of high quality materials, aesthetically pleasing, and providing a measure of support and comfort that’s difficult to match for the same price point. The unique cooling features and the amount of memory foam used is simply great value for money, plus there are two firmness options—and the fact that it’s an eco-friendly product is the cherry on top. If you have the budget to get more than just a starter mattress, love the memory foam feel, tend to sleep hot, or want to support a more environmentally sustainable approach to commerce, you should try the Loom & Leaf luxury memory foam mattress.